Tuesday the 8th of March 2011 will be the last day of almost two weeks of Carnival celebrations for millions of people in Europe and other Catholic countries. 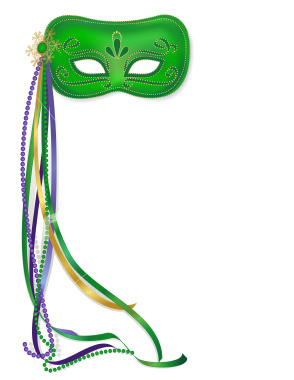 In Italy we call it "Martedi` Grasso", that like in French means "Fat Tuesday" . It is the day preceding Ash Wednesday, the first day of Lent that for observant Roman Catholics is the start of 40 days of fasting and absinence before Easter. That's why Fat Tuesday is in theory the last day you could have fat and very rich food, indulge in parties and let yourself go a bit more than you should... And that's why, before it is too late, I want to give you the recipe of my favourite traditional Italian Carnevale's sweet: frappe. But they are fattening, I warn you, otherwise they would not be part of Martedi`Grasso celebrations! Enjoy! 250g flour, 80gr sugar, 2 eggs, caster sugar, olive oil, orange and lemon peel, sweet wine, salt to taste. Pour the flour onto a suitable work surface and mix in the sugar, salt and a couple of spoons of the wine of choice, along with the whole eggs. Create a soft pastry and put it to one side for around 30 minutes. Then roll the pastry into a thin 'sfoglia'. Cut out the frappe to your preferred shape with a knife and fry in hot olive oil. When they are a golden colour, remove and place on absorbent kitchen paper. 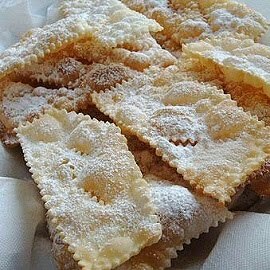 Finish by presenting all the cenci on a single serving tray and sprinkled with copious caster sugar. 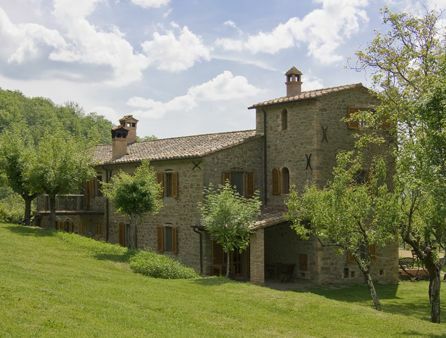 A stone farmhouse in Tuscany basks in the sunshine, surrounded by olive groves and cypress trees. The view from the terrace is of autumn mist rising across Umbrian hills. In the distance the bell towers and domes float on shrouds of white, the church bells muted in the milky mist. Down in the valley the leaves in the newly harvested vineyards are dazzling reds and purples. In the olive groves, the branches are laden with ripening fruit as the villagers gather to pick them. Black olives drop from the tree shading this table. Dried and withered cornstalks stoop like arthritic old men. The scent of wood smoke drifts across the valley. And the earth turns towards winter. All through the summer at this long wooden table a passing parade of travellers - priests, poets, ancient Umbrians - eat tomatoes still warm from the vine and wild herbs foraged from the forest by an octogenarian woman from the village, down jugs of wine made by a neighbour. On every hilltop a ruined castle, on every ridge a row of cypress trees, the rhythms and customs of life mirrored down centuries, a tangible sense of those who have passed before. These are magic days, the soft focus dream in the amniotic warmth of summer. It is a seduction, a beauty so beguiling, a euphoria so intense people can lose all sense of reality. "The idea that one could move to Italy and find eternal happiness is so firmly planted in many people's minds," writer Lisa Clifford says. It was recently estimated more than 30,000 Australians are living in Italy. But the hills of Tuscany and Umbria are littered with the broken dreams of people who thought the romance would never end; that they would write the bestseller, find the beautiful man, fix up the ruin and make a living running it as a bed and breakfast, that it would miraculously work out like it does in all those books that flood the market, where everything is quaint and amusing. Instead, if you aren't careful, the dream can become a nightmare. Often they go limping home, relieved of all their money. "They come with stars in their eyes and think it is going to be like Under the Tuscan Sun and start restoring a farmhouse without thinking it through. A lot of them come to grief," says 60 Minutes journalist Gareth Harvey, who lives in a Tuscan village. Indeed, when Under the Tuscan Sun came out, the bemused town of Cortona suddenly found itself host to hordes of middle-aged women escaping every kind of heartbreak. We drank a lot of peach bellinis under that sinking Tuscan sun in the summer of the broken heart. Those seeking enthusiastic Italian men were often doomed to disappointment. One beautiful, vivacious friend of mine fell in love only to discover he was a mamoni, too attached to his mother to form a real relationship. She was by no means the only foreign woman to find herself in unarmed combat with a formidable mama masquerading as a sweet little old lady, nor the first to discover how impenetrably intertwined are traditional Italian families. The differences of culture and values were brought swiftly and jarringly home to me. My own adventures in Italy started when I fell in love with a charismatic but very poor Italian artist while visiting friends there. I left an affluent life in Manhattan in a delirium of optimism, to live in a tiny village on a hilltop in Umbria. I don't know who was more shocked, the conservative Umbrians or the freewheeling big city journalist. I found it impossible to conform to what I perceived as narrow-mindedness, was unnerved by all the judgmental eyes on me all the time and continually embarrassed my boyfriend by committing social crimes such as - gasp - drinking wine alone in the local bar while reading a book. In famously sober Italy, alcohol is usually taken in moderation with food and rarely for its own sake. Public inebriation is social death, and alcohol is something that has brought many a relationship undone. And an independent Australian feminist was only going to be on a collision course with a controlling Neapolitan man, however great the love. The enduring love affair turned out to be Italy itself, as painful and tempestuous as a love affair can be. Clifford wrestled with her relationship with an Italian man for 18 years before marrying Paolo and settling in Florence. Her bestselling book The Promise deals with the "conflicting passions and cultural differences that I encountered while faced with the decision to either stay in Tuscany for Paolo or to return home to Australia for my family and career. "So many people think that their love is going to be enough, then they encounter various cultural issues and different roles that one really isn't prepared for." In starting a new life in another language in a deeply foreign culture, the difficulties can seem insurmountable. "Everything is hard at first. You have a language to learn and not only grammatically but to learn to read between the lines," designer David McMillan says. "The most sensitive and important item is the acquisition of the talents to decode social behaviour and to learn the codes well enough to express yourself correctly. It is easy, not knowing, to offend or become ridiculous and-or be treated as the exotic expat, which was something I avoided like the plague. "The simplest things in Australia can become daunting mountains to climb in Italy. "The Italian bureaucracy is thick and complex, any simple request from a state office to the post office becomes complicated and time consuming," accessories designer Luisa Fazio says. 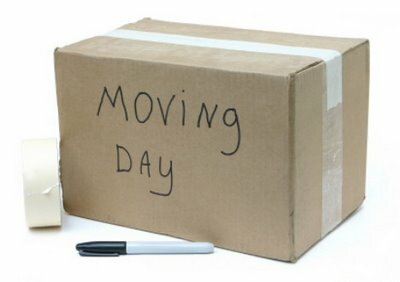 Comical lingual mistakes and mispronunciation are not so funny when there are serious consequences involved, such as buying a house.The labyrinthine bureaucracy is an ever-changing, unpredictable, unfathomable beast. The legal system is so antiquated and slow that no one seriously resorts to it or relies on it. Instead they take matters into their own hands. The famous Italian warmth can evaporate fairly sharpish over money issues. One friend of mine found herself barricaded in her house when a man she was having a financial dispute with simply stood outside the front door everyday. "There are no clear and straightforward rules, so people just create their own. You learn to live in this chaos, but after some time it can get tedious," Fazio says. To add to the frustration, in the country everything closes between 1pm and 4pm. No matter how urgent your problem, nothing is going happen at lunchtime. "Italians live in quiet rebellion towards the state," Harvey says. "What usually happens with foreigners is that they tend to try to wrestle the system. But you certainly don't assume that it is anything like the Anglo system. You have to learn how to roll with it and you need good Italian friends to help you stumble through it." This chaos can be worked to your own advantage, of course. Unlike over-regulated Australia, Italians don't tend to sweat the small stuff. As long as you don't do anything stupid you can fly under the radar. "I don't even want to open the bureaucratic door," says Jennifer Storey who has lived in Florence for eight years. "It is a series of loops and modules and circles and things. Italians spend a good part of their time figuring out how to weasel out of it. "And despite all this, Italy does work as a sophisticated country. It is hardly surprising Italians have a heightened sense of the ridiculous, absurd and tragic. "Italians have an incredible joie de vivre and I love their approach to life," Fazio says. "In Milan, where I live, everything is a social affair: you go to the local market and the merchants offer you a glass of wine as you choose your fruit and vegetables. "People interact with each other all the time. You often go out every day of the week and meet your friends in a piazza, a bar or a restaurant rather than going home and watching TV after work. "It is virtually impossible to reconcile the northern hemisphere with the southern: they are polar opposites. Nanette Davis loved her life in Florence but returned to Melbourne to look after her mother when her father died. "Living in Italy is like being confronted with concentrated noise, movement, confusion and life. I personally miss the whole mixture. But add to that music, art and age-old traditions and you have an intensity of life that is addictive and that is missing in Australia," Davis says. There are people who come to Italy and never really get to know Italians, don't learn the language and never know what is really going on.They do up the ruin, then mix only with other expats, often bringing the worst of their own culture with them.The reason most people come a cropper in Italy is financial. The beautiful horizons rapidly lose their charm when you are broke. They don't tell you in the tourist brochures that the winters are long and brutal, and the cost of heating ruinous. It is not easy for Australians to work in Italy, but it is very easy to run out of money. Florence is full of women who came looking for romance and now find themselves in low-paid menial work, still clinging to the romantic fantasy of a life that has never happened. One former Australian media executive I know uses his car as a taxi. Another works as a labourer. Former sociologist Mara Seer who lives on a small pension in Assisi, says: "I can walk up the mountain and gather my fill of wild rucola, or walk down to an abandoned orchard to load my pack with figs, grapes, apples and quinces, or my 88-year-old friend brings me eggs from her daughter's hens or bags of wild greens, and the woman who sells her own produce daily in the street always loads me up with more than I buy."Wine? I stopped buying wine entirely. Soon after that my neighbours started supplying me with homemade wine, I don't even know why; when I've finished the bottle they've left me I put it back in the basket on my gate and it turns up full again that evening." Living in Italy is for most people about making sacrifices, about learning to live on less, unlearning material values and learning a deeper appreciation of the every day. It is about working to live instead of living to work. It is about long lunches under an olive tree in good company and concerts in every piazza in the summer. It is about classic beauty, watching the changing seasons, the rich earth and what it brings. It is about great art being a part of everyday life.The problem is, once you have lived with that kind of beauty it is very hard to live without it. There are literally hundreds of festivals across Italy each and every year! Many are medieval and cultural festivals whose origins extend back hundreds and even thousands of years, while some are of a more recent invention. Carnival (Carnevale) is a huge winter festival that ia celebrated around the country with parades, masquerade balls, entertainment, music, and parties. Carnevale, like Carnivals in the UK and US and Mardi gras in other parts of the world, is celebrated in Italy forty days before Easter, as a final party before Ash Wednesday and the restrictions of Lent. Carnevale is one of Italy's biggest festivals and events often last for two to three weeks before the actual carnival day. Carnevale has roots in pagan festivals and traditions and as is often the case with traditional festivals was adapted to fit into the Catholic rituals. Like many other festivals of our calendar, it derives from an ancient roman cult the Saturnalia, pagan rites of fertility which were celebrated in honour of the god Saturn. During those celebrations everything was allowed, even disguising and change of rules. Carnivals were modified substantially because of its magic and ritual nature with Christianity, but the clergy still tolerated it. Those who are visiting Umbria in February are likely to find Carnival festivals, float parades or masquerade balls, in any small town. During the carnival in Umbria you may taste the strufoli, a sweet typical of Perugia made with honey, sugar and candied fruits. The most common are the frittelle and obviously the frappe and castagnole. The cicerchiata is another typical Umbrian recipe. This one, like the strufoli, is a traditional Umbrian sweet, but has been wrongly considered Abruzzian. It is made with small balls of pasta sunk in orange honey and garnished with candies and sugared almonds. Next week Abode Srl are moving to Niccone, on Via Caduti di Penetola n.39 06019 Umbertide (Perugia).